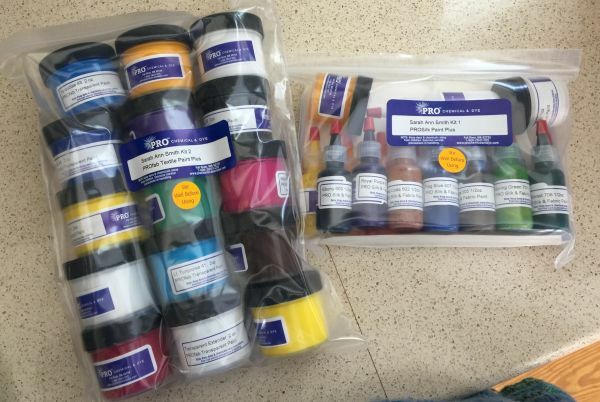 Save substantially on shipping by ordering BOTH of Sarah's PaintPlus kits here! Sarah's DUO includes both the PRO Silk PLUS Kit #1 and the Profab Transparent PLUS Kit #2. Sarah's ProTransparent Plus Kit #2 includes 15 jars total. Larger jars of paint are available to reorder directly at the ProChemical and Dye website. Available April 20th! $74.35 I will turn on the Add to Cart button about April 6th so you can pre-order. Please note that I will be travel teaching and cannot fill orders until on or after April 20. Thanks for understanding.